I just wanted to honor a former student of mine when I was a youth pastor in this blog. He died last Monday of swine flu complications. He was just 26. He was an incredible young man, beloved by many, very active in ministry and full of potential. The service was yesterday. I obviously wasn’t there. I tried to watch the livestream online, but my internet went off just as it started. The picture is my former pastor, Jerry Mitchell, doing what he does best, preaching about Jesus during this service. I still can’t believe that he is gone, and yet his impact on this world is far from over. Thanks for reading. My name is Steve Allen. 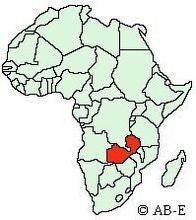 I am a missionary in Zambia with my family. But, many years ago, I was Justin’s youth pastor from the latter part of his Junior High years and then through his High School years. We experienced a multitude of retreats, mission trips and fun times together. We kept in touch over the years and it was so great when I eventually got to work alongside him when he and I were staff at youth camps. Then, he had a vision to start a ministry for young men at Crossroads, bringing in the older men of the church to teach the younger men how to be men. He called this group the Young Men’s Project. They not only learned how to BBQ, fix things, study the bible but they also did ministry for the poor. He invited me to speak at the ministry he started. And it was everyone youth pastor’s dream to see his former student become the teacher. I wrote back and gave him some advice. How do we make sense of this loss of the HUGE mountain of potential that was Justin? He was smart, really smart, smarter than all of us combined, funny, witty, full of joy and laughter, insight, caring, vision and passion. Why would God take a young man like this from this world that desperately needs young men like Justin in it? I don’t pretend to have the answers nor will I even begin to try. But, it is more than irony that he was writing to me about how to be a public speaker. I believe that God not only grants us the desires of our hearts when we delight in Him as Psalm 37 says, but he also gives us the desires that we desire. God implanted this desire in Justin to share Jesus with the world and then God gave this aspiring public speaker the biggest stage possible so that as many people as he touched and many that that he didn’t, could at one time, hear the love of Jesus through this beloved young man. There is no bigger stage than a memorial service. Ecclesiastes 7:2 says: “It is better to go to a funeral than a feast. For death is the destiny of every person, and the living should take this to heart.” It is better to go to funeral. We are all going to die and so it affects all of us. There is no pretense in death. Death demands your attention. And I believe it is the best stage for Justin to share with you what matters most. And though it is not him physically speaking, his life speaks and everything he lived for speaks and everyone he touched speaks and everything he believed speaks out for everyone to hear. And so, if you are wise today, you will hear what a well-lived life says. The evidence of the impact of his life is AND will continue to be a stage where he will not exit for many days and months and years to come. God indeed has given this young man a speaking opportunity that is bigger than anything he could have dreamed of. What do you think Justin would say today if he had his chance? I believe he would quote Philippians 1.20-21 - For to me to live is Christ, and to die is gain. I believe he would say to us today that though he has seen the highest of mountains and the most beautiful views and the most incredible sunsets and the most beautiful art, that nothing compares to Heaven. I believe he would say that though he wanted to get married that nothing compares to the wedding of the lamb, that he knows intimacy and joy and love that far surpasses anything this earth could have given him. I believe he would say that he bet right. This young man who loved to bet in poker, that when he went all in on this unseen reality of a God in Heaven, and when he lived this truth, “That to live is Christ and to die is gain,” that he truly won the biggest bet of all… He would beg for you to realize that life is short and eternity is long and he would quote the Bible verse: Mark 8:36 - For what does it profit a man to gain the whole world and forfeit his soul? I believe he would say to those who are living for Jesus, keep walking faithfully with Jesus. Let nothing distract you, deter you or discourage you. Persevere knowing your work is not in vain. I believe he would say to those who have strayed from Jesus-don’t waste your life. There is nothing that compares to the glory of living for Jesus. You are missing the best that life has to offer. He would look you in the eye and give you one of his huge hugs and say, turn around, repent, follow Jesus. And I believe he would say to those who have not trusted your life and your eventual death in the love and life of Jesus, please, reconsider, fear God, trust God and love God with all your life. He is speaking his most important message today. I pray that you listen. You will be missed, my brother. Thank you for teaching us all. What a beautiful tribute. I attended CBC for about two years in high school, and many retreats as a guest long before that. I didn't know Justin well, but we had many mutual friends and a couple of conversations. When a friend told me of his passing, 8 years after last seeing him, his face still instantly came to my mind. It is easy for those without hope to say that Justin's loss was such a tragedy, such a waste. Less than 24 hours after Justin's death, the Facebook group started in his honor already had 645 members. Now, well over 1,000. One thousand people touched by one. 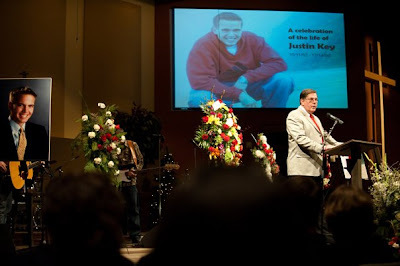 One thousand lives inspired to be lived better, fuller, and more completely because Justin was the man he was. We cannot measure the influence Justin has had, the mark his well-lived life will continue to leave on this world, a place that so desperately needs more like him. Tragic, yes. A waste--certainly not, and I am grateful for that. Thank you for your words--and my prayers are with you and your family as you continue your ministry! My trip to Village...A recap! Should we FIGHT them or EMBRACE them?